German motion designer Michael Müller shares his unique entry into animation, what he's learned from School of Motion courses, and his big dream of working at Gunner. Our Alumni always impress us with the solid work they produce and the dedication they have to growing in their craft. Michael Müller is a School of Motion Alumni who is right at the front of this pack. So far Michael has taken four of our courses in just fourteen months. If you dig through his Instagram you can see just what fourteen months of working really hard can do to your skillset. Michael is producing great work that would have taken most people years to produce. So, we wanted to get into the mind of Michael, learn about his passions, and figure out where he gets his drive. In this interview we chat about freelance, what motion design is like in Germany, the painful learning curve for script development for After Effects, and much more. So say hello to Michael Müller. I wish I could say that I started drawing flip-books at the age of nine. But, to be honest, animation wasn’t on my radar for the majority my life. Becoming a motion designer was not my intention. Towards the end of 2017 there were a series of fortunate opportunities starting opening up that lead me here. I did go to traditional art school for two years, always liked to draw, played different instruments, ran a YouTube channel and things like that. Being able to edit videos for my YouTube channel was helpful during an apprenticeship as a graphic designer. I was the only one at the company who knew how to edit videos, so that's what I did most of the time. Eventually this lead to creating motion graphics, and at that time I was animating in Adobe Premiere Pro. Yup, I animated a TON of videos entirely in Premiere Pro without knowing what I was doing. Literally faking trim paths with animated masks until, about one year later, I finally discovered After Effects. Oh, how much precious life-time I wasted. But hey - "fake it till you make it" as they say. The Shift took place when I one day stumbled across “a guide to American football” and immediately fell in love with its seamless flow. From this point, I watched tutorials all day long and it didn’t take me long to become aware of Joeys "30 Days of After Effects" series on School of Motion. The days of trying to figure out each and every bit by myself were over and I knew this would be the better approach. 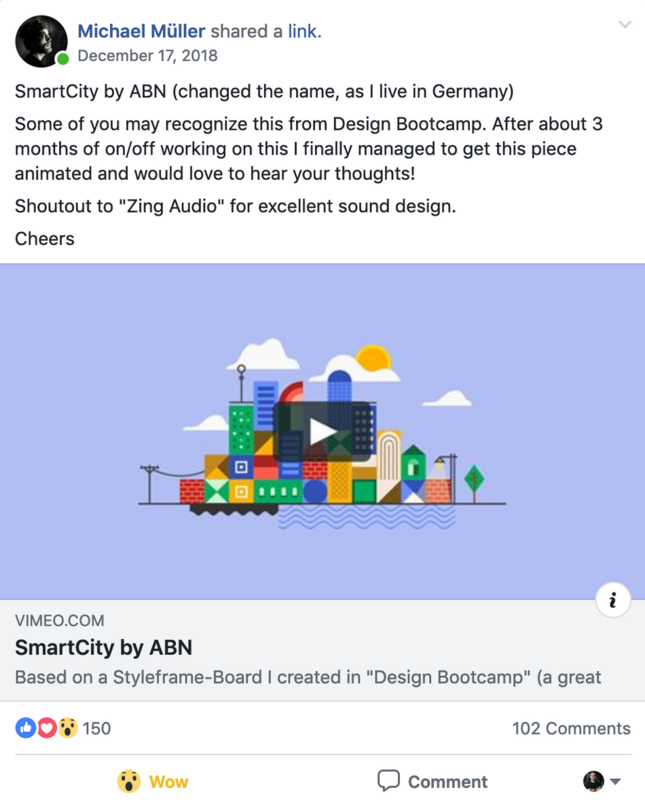 What's the motion design scene in Germany like? Here it feels like there are very few motion designers and studios around; probably 5 in major cities. There are a couple of small studios as well but most of them work sort of in between video editing and motion design. The most successful studio I know of is Kurzgesagt, based in Munich. Through School of Motion, I managed to meet two German motion designers in person. They’re the only two freelancers I met so far. Apart from this, when I try to explain to people what I’m doing around here, they usually think I create websites. You recently shifted from being a graphic designer to freelancer. Why did you make the change? How has this process been for you? I hadn’t completed my apprenticeship as a graphic designer when I decided to leave the company and become a freelancer. I didn’t even have a portfolio back with work as a graphic designer. I hadn’t even heard of the 12 principles of animation at the time. However, what I did have was a copy of The Freelance Manifesto by Joey Korenman. On top of that, the company I worked at really liked what I was doing. So I knew my work was good enough and there was something to build upon. I basically put all my trust in the School of Motion courses, hoping that I’d be able to impress some folks with the outcome of the final projects and land a few jobs. Even though most of the people around me thought it was a stupid idea. But, some unknown universe forces compelled me to jack it all in and encounter life with nothing but a vision (and a subscription to The Creative Cloud). The person who was closest to me at the time completely had my back and believed in me a lot, which helped very much. I was also already freelancing a bit as a graphic designer, which made the transition a little less harsh. Thank God, School of Motion totally delivered and the plan worked out so far. Your Instagram channel shows just how fast your skills as an artist have grown. What are you doing to work on your skills so effectively? Note from Michael: "Disclaimer to the reader: this interview isn’t sponsored." Technically, pretty much all of my knowledge and animation skills comes from the experience of School of Motion courses. They have always been and still are a huge part of my small career as an animator. All of my growth goes back to them. 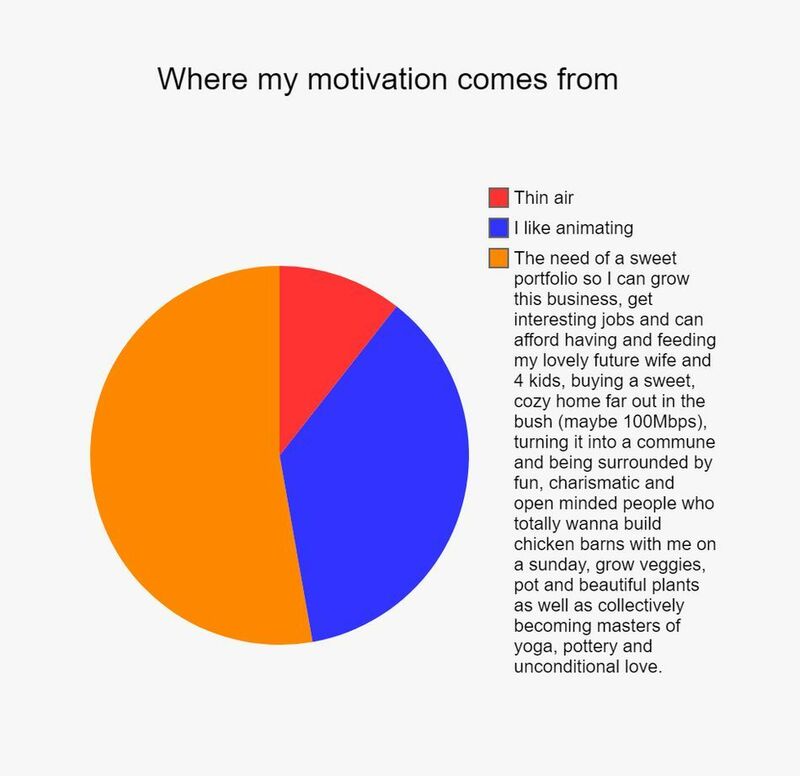 I usually worked full time on the exercise projects. I think committing all my time to deeply soak up everything taught, writing it down and applying it immediately has proven to be a good recipe since I started out. The “course-groups” on facebook are also extremely valuable because you automatically also learn from the mistakes and successes of others. Seeing the same approach from various perspectives is the best way to figure out what’s most important for the exercise and what worked well for many. Other than that, I don’t follow any particular routines like “animate something every day.” I’m just very interested in the topic and always, in my intention to get better, try to push the bar a little further with every project. Naturally there gets work produced along the way and it seems to improve over time because you always take away something from the last project. Though while you’re riding along this process day after day, in that moment it doesn’t feel like you’re improving a lot. You have a few personal projects online, how do you get these ideas, and where do you get the motivation to follow them through? Usually, my personal projects are driven by some fantasy. I randomly will have an idea, and then i'll just write it down. Otherwise I know I’d forget about in half an hour. Later, when I have time, I pick something from the list and make it a project. Unfortunately, most of my ideas would take me several months to complete, which there is never time for, so I tend to create only the very small ones. Sometimes I want to get familiar with a specific plug-in or workflow and that “test-file” evolves into a small personal project. We love seeing students finish final projects from our courses. Which final project was most fun or challenging? All the final projects were both fun and challenging. I think the most challenging for me was Axel Dangerson from Character Animation Bootcamp. I found it incredibly difficult to keep track of all the 287,000 properties at the same time while still focussing on animation principles. The most fun was probably the Ice Sculptor project from Animation Bootcamp. As far as I remember, I didn’t struggle at all coming up with ideas for this animation, but I tend to forget the parts where I ripped out my hair after a while. Design Bootcamp incredibly demanding and definitely the one I struggled with the most, even though I had a background as a graphic designer. This once again shows how little you take away on the path of classical education versus an intense online course. That is to say that before going into Design Bootcamp, I already thought of myself as a decent Designer and couldn’t have been more wrong. It was very tough but I was able to take away a lot and create a decent design for the SmartCity project, which, as I loved the Illustration style so much. Right after I finished the designs I took a good bit of time and animated the whole thing, and I loved the process. Everlearn.io animation by Michael Müller. You actually developed a script for After Effects, what made you want to create that? What were some of the biggest challenges, and how did you go about networking for help? I don’t want to claim that I developed Separate Multiple Dimensions by myself. I was rather the person who helped to bring it to life. The script needed to be developed because it adds a very handy function to the software. Being able to separate the dimensions on every property is a feature that has been requested for over a decade. I knew a some expressions at the time, but Extendscript is an entirely different level. I spent weeks trying to figure out specific elements of language that were needed for the script, for the most part without any success. I reached out to the folks on the official adobe forum, one of them was Tomas Sinkunas (co-creator of “Flow”). He helped me build a good foundation out of my crappy code. Trying to fix all the errors, I got more help from Dan Ebberts on Creative Cow, Rodrigo Dominguez from the alumini group, and a bunch of other people. Eventually, I was able to patchwork it all together. Ideally, where would you want your career to take you? A major studio, freelance forever, owning your own studio? Speaking long-term, I want to stay a freelancer. It just has huge benefits that fit my personality really well. For example, I really like to work at night. I also enjoy listening to music while working without having to wear headphones, which co-workers found to be very annoying in the past. Nevertheless, I know that truly outstanding projects can only result from a hard-working team, and I don’t want to miss out on that experience. That is to say that I definitely want to work in a studio at some point. Preferably at a place where every person has a specific role, instead of everyone being swiss-army knives. I think that’s one of the things which may differentiate major studios from typical agencies. At this point in my career, I can hardly imagine working with one of the top players in motion design. There are so many great animators out there who are doing work so much better than mine. I don’t know if I have what it takes to get to a place like that, as much as I’d love to surround myself with vibrations of passion. I often dream about getting an internship at Gunner. Maybe as I become more confident and gain experience, an opportunity like that will appear; time will tell. What really hooks me are funny questions. Like, "At which frame-rate does reality refresh?" Is there even something like a “shortest period of time” which could be considered a frame in life? If so, how much or little needs to happen until the next one is worthy enough to take its place? ...Thinking about these sort of things gets me surprisingly excited. I’m obsessed with the idea of waves of any sort as well as patterns, energy and the seemingly infinite depths of nature/the universe. I’m also totally in love with many sorts of music including soft, repetitive techno-ish dance music and psychedelic rock. What also gets me very excited is other people talking about what gets them excited. Do you have any tips for staying inspired? I’d say listen to people passionately talking about something, where ideas are being communicated with passion; there is a great chance to be inspired. I recently got a ton of inspiration from Sander van Dijk in the Advanced Motion Methods class, and I strongly recommend you listen to his ideas as well. "What are your passions?" "What do you think of as meaningful?" "What do you think is worth communicating?" You can find great inspiration by being honest with yourself. I also find it very inspiring to think about contrast in each and every way of the definition. Thinking about two opposites or comparing different situations often naturally evolves into an idea. You've been a part of our Alumni group for quite some time. What are some of the benefits you've had personally from being there? I’m glad you brought this up. I’m a huge fan of the Alumini group. It is by far my favorite online community and the reason why I still have a facebook account. It’s a place where people help each other with technical difficulties. It’s a place to share meaningful information, knowledge and techniques for our industry with people who dig it. It’s a place where hard work gets the appreciation it deserves. It’s a place to connect with fellow motion designers all across the entire planet. It just makes me feel like I’m not alone with my obsession for moving images. I’m very happy to be a part of it and enjoy watching it grow. If you could impart any wisdom to artists and new students to our courses, what would you like to say? If you want take the most out of a School of Motion course, you better cancel all your appointments. The courses are very intense and can help you grow immensely in an incredibly short amount of time; you get as much as you put in. How much that will be, depends entirely on you. I’m very happy with how far I got in 14 Months and 4 courses. For the most part, I took the courses as a full-time investment, and while this may not be possible for everyone, I’m glad I did it that way. Oh and remember: the long way turns out to be shorter. Meaning, don’t take Advanced Motion Methods first. What else does Michael have to say? See if you can spot him in our Student Testimonials! Want to join Michael on a journey of learning and growth? 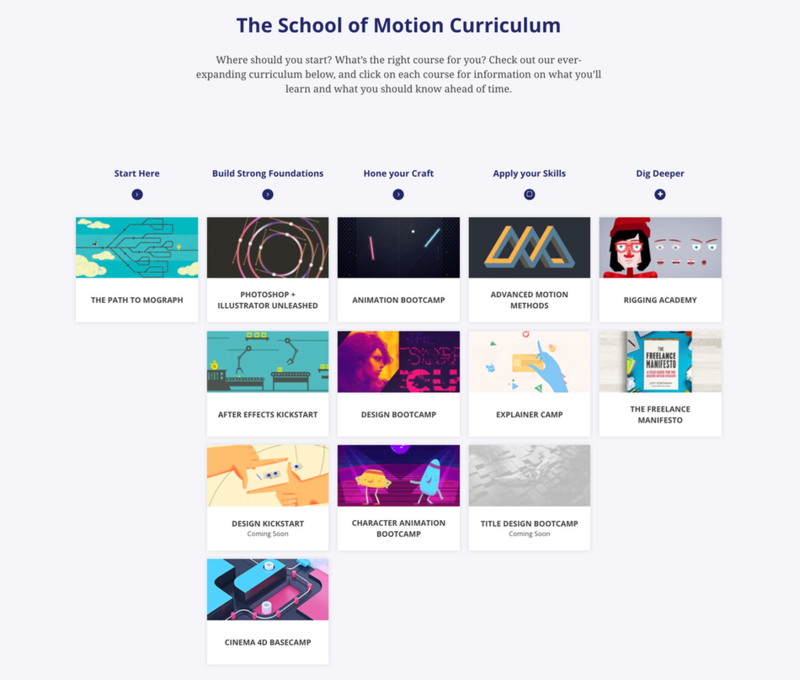 Check out our courses page to find in-depth Motion Design courses! You'll be learning from the best in the industry alongside other motivated and eager artists looking to hone their craft.